Simon's Cat: why do cats love cardboard boxes? It’s a mystery to owners across the planet. Why is it that, when offered up expensive cat towers and the latest toys, cats always prefer playing with a cardboard box? Whether it’s as a makeshift shelter or a plaything, the humble cardboard box has become a great thing for cats to enjoy – as the new Simon’s Cat film explores. The latest instalment in the Cat Logic series, entitled ‘Boxes’, shows one of Simon’s cats playing with a box as his exasperated owner looks on. This is accompanied by a commentary by Behaviour Expert Nicky Trevorrow, who explains exactly why cats are so drawn to them. “Cats feel safe in enclosed spaces” she says, before going on to explain how the small, enclosed space of a box with sides can act as a miniature fortress. She also talks about the fact that it isn’t just nervous moggies that want to burrow themselves away in cardboard. Boxes aren’t just great spaces for hiding either. They are great for playing with and as Nicky suggests, are particularly useful for enrichment toys. There is even a how-to guide on the video to demonstrate how you can use a cardboard box to feed your cat in a mentally stimulating way. 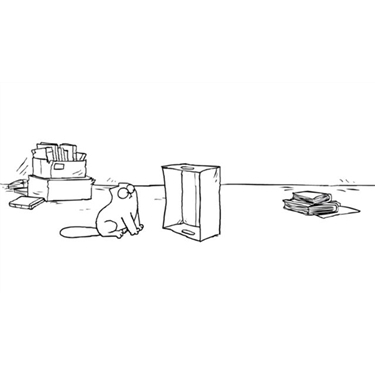 Watch the Simon’s Cat video below to learn more about cat logic.